An oft overlooked device on any coach is the Entry Door overule valve. 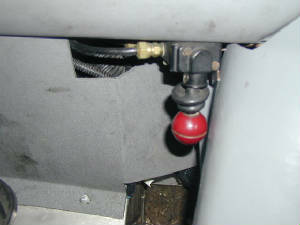 Located under the dash, near the baggage bin lock release, the Entry Door over rule valve dumps the air from the entry door locking mechanism, therefore over-riding the latch. Sometimes an operator may have an issue with the door not latching properly when it is closed with the door handle or entry door switch. The latch may close before the door gets there, or more often, the door may close so fast that it bounces and the latch misses the catch. When this happens, you can over ride the latch by flipping the red handle under the dash down (on most models, pull the red handle back on a G). When you do that, you should hear the air "dump" from the door latch air cylinder. The entry door will no longer work if you push the button. However it will be easy to pull it closed by hand, and then when you have it closed, flip that red handle back up and the latch should grab the catch and the door will stay secure. This will also help, if for some reason the door will not unlock, just dump the air, the lock will release, and push open the door. G45 entry doors deserve a whole other article, and it will be coming soon. D model Entry door over rule valve. It looks the same on an MC-12. The G45 is opposite, pull back to override, push forward for normal. Now, if the latch just isn't working, then you can still use the over ride to help you. 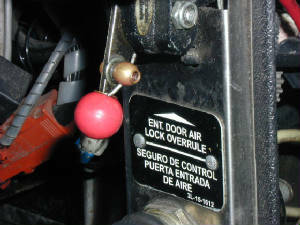 In this case, dump the air using the over rule valve, then pull the door shut and use the sliding manual lock. It's pretty much like a little dead bolt. You may have to do a little shaking in one direction or another to get it to line up. All this beats driving down the road with a door that wants to swing open and the noise that goes with it. On the D there is also another lock at the very top of the door if you can reach it. Another thing to keep in mind about a D model, if you have to reset the battery switch for any reason, the entry door will probalby close automatically when you turn off the battery. ANY time you are going to turn off the battery switch, for whatever reason, first dump the air from the entry door over rule valve. Like I said, the G entry door is a whole other article. 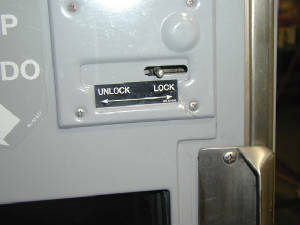 The D model top door lock. If the problem you are having is the door shutting too fast, using the over rule valve is the best thing for an Operator to do. That being said, this can be repaired at ANY service island. It can be done, if prepared and experienced in doing it, in about 45 minutes tops. If it is a mechanics first time, it could take longer. Operators should not attempt the repair. The reason the door closes fast is most usually air in the entry door cylinder. Yes, the door requires air to operate, but it also operates on coolant. When air gets in the coolant is when the problems arise. To fix it, you have to bleed that air out of the coolant. To do this, locate the door cylinder behind the step well panel. On top of it are two brass elbows, with hoses attached to one side and a plug in the other. Remove those plugs and attach a clear piece of tubing or hose long enough to reach the top of the dash, about 3 feet is plenty,to each fitting. Put it all back together and the door should close slowly. A perfect door should take at least 3 seconds to close. 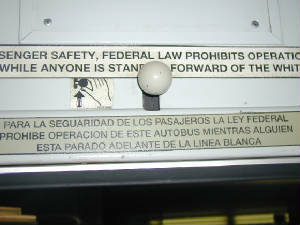 The entry door over rule is a safety device and is required. You should check it as part of your Pre-Trip inspection. Brought to you by The Doghouse, you source for maintenance communication.